Newgrange Lodge is a unique venue located only one minute’s walk from the world famous heritage site of Newgrange, Knowth and Dowth located in the heart of the beautiful Boyne Valley. We offer accommodation for both independent travellers and groups alike. Our rooms include a mix of 23 Double/ Twin and Family rooms and a number of multi bed rooms that are ideal for accommodating large groups on a budget. We are excellently located only 35 minutes from Dublin Airport and only 1.5 hrs from Belfast city, at exit 9 just off the M1 motorway or turn right off the N2 Dublin to Derry road before the village of Slane. 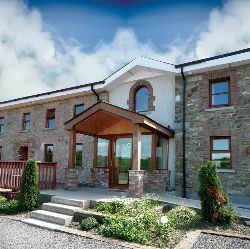 Enjoy excellent facilities and accommodation in a peaceful and tranquil location overlooking one of the Irelands most fascinating heritage sites in the heart of the Boyne Valley.